Our sample model release forms can be tailored for a variety of applications. The photo release featured on this page is an abbreviated version of our other lengthier and more comprehensive forms which is also available on our site at no cost. Non-professional models who are not used to seeing a lengthy legal document may be overwhelmed by the terms in the agreement and therefore reluctant to sign it. They may be more amenable to signing a simpler permission and release form. Although this shortened form does not cover all the provisions in detail as in our longer sample model release forms, it may still be better than not having a release at all. 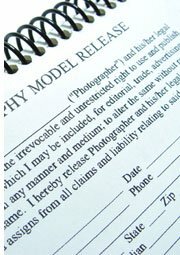 Our main page on Photography Contracts provides additional information and legal guidelines. Whereas for valuable consideration hereby acknowledged as received, the Model granted the Photographer permission to photograph him/her and thereafter to use the photographs in whole or in part without restriction anywhere, in any medium, for any purpose and altered in any way. The Model releases the Photographer from all claims of liability relating to the use of the photographs. This permission and release shall be irrevocable and binding upon the Model's successors, legal representatives and assigns and shall accrue to the benefit of the Photographer's successors, legal representatives and assigns. Note: Offering an opportunity for people to list exclusions or reservations may also contribute to their willingness to sign a release. It could also prevent the use - however unwittingly - of the photographs in a way which may be perceived as defamatory by the Model. It is always best to discuss the intended use with the model beforehand! Is a Model Release Always Necessary? The photo will be published and the person can be recognized. There are exceptions here though - if the photo is relevant in a news article or editorial or if the image is used for artistic expression. The photo is used in a way that seems the person is endorsing a product, service or (even a non-profit) organization or it's used for advertising purposes. There's no reason really not to use our sample model release. It could save you any number of headaches at a later stage. If you need to issue a release for clients to make reprints of photographs, please refer to our photo copyright release form. Note that this does NOT release the photographer's copyright in the work, but only releases a photo store from liability when making reprints of images. Without this written permission they may well refuse to make any reproductions. This sample model release and other free legal forms available on our site are made available for informational purposes only. Consult with an attorney to ensure your documents are complete and comply with the law in your jurisdiction.